The below is from a WPF research briefing paper, “Mandates or Bind Dates: Addressing the Challenges of Mandate Development Processes Supporting African Peace Missions” produced as part of the African Peace Missions project. You can access the entire collection of research briefings and the final report, “African Politics, African Peace,” on our website. As of 2015, 43 peace operations had deployed to 15 different African countries. Africa’s increasing efforts to support its own peace operations have led to African peace and security organisations both leading on, and contributing the mainstay of personnel to, these missions. This paper examines a number of African peace operations and analyses the evolution of the mission mandates. 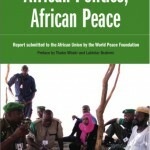 A selection of four representative peace operations – Democratic Republic of Congo, Central African Republic, Somalia, and Darfur – which differ in terms of timeframe, implementing authority, size and conflict dynamics are examined to assess patterns, trends and anomalies of mandates over the life cycle of their missions. Academic and policy-related literature places emphasis on the impact of UN Security Council geopolitics, roles and responsibilities supporting civilian protection, the AU’s financial, materiel and human resource deficiencies, and the role of peacebuilding. However, little has been written on the evolution of wider peace mission mandates as well as the role of African organisations in developing these mandates. The analysis of the case studies reveals six trends, outlined below, which address both the content of the mission mandates and the way in which the mandates were produced. Linkages between initial mandate text and provisions of peace agreements: The text of initial mandates tends to reflect the text and provisions of the peace agreements, as well as the real issues and situational aspects on the ground. For most African peace operations, and particularly for African mandates, the peace agreement is brokered based on consultation and consensus of local actors in the conflict, which raises interesting issues for the role of African Mediators. The value of African-led mediation and facilitation capacity: Despite being a valuable resource, which shapes and informs the operational and political components that are deployed thereafter, African mediation, dialogue and conflict resolution capacity lacks institutional systems and support. Although both the UN and the AU have developed mediation support units (MSU) – and despite the UN having a well-developed roster of international mediation experts – the AU’s MSU continues to focus only on the analysis of ‘lessons learned’ and postmission analysis and not the human, financial and logistical requirements that these panels and groups require. The ‘partisan’ nature of TAMs and the impact on TAM outputs: The importance of the African-led mediation and facilitation efforts should also be examined against the outputs of the Technical Assistance Missions (TAMs) which are often deployed to peace operations to provide feedback for both the Chairperson of the PSC and the UN SecretaryGeneral. Whereas the data notes synergies between the work of the African-led mediation and facilitation panels and the feedback provided to the AU PSC through technical reports, the connection between the outputs of AU mediators/technical assessment reports and the UN mandates was less evident. A look at the composition of the UN TAMs reflects representation from most of the organisation’s peace and security related organs. It could therefore be argued that the UN TAM reports that influence evolving UN mandates become skewed by the competing interests of members of the TAM. ‘Universal’ vs ‘Core’ Mandates: The analysis in this paper exposes the fact that a relatively ‘templated’ approach is taken to the development of UN mandates. The templates which serve as the framework for mandate extensions and renewals also bear a direct correlation with the strategic policy agenda in place across various UN Departments at the time of the mandate expansion. Where more detailed and countryspecific requirements are included in the mandate, these non-templated requirements often form part of either AU mandates or text of AU resolutions which have influenced UN mandates. Moreover, it appears that the ‘bloated’ nature of the mandates comes normally as a result of tasks and activities from previous mandates not being discarded from the new mandates. Templated aspects of UN mandates reflect more of a ‘universal’ mandate that arguably justifies the applicability and relevance of UN policy and programmes to field-based realities in conflict-affected countries. However, within the initial mandates, and often preserved during the mandate’s expansion, a ‘core’ mandate remains. Lack of clarity supporting the concept of ‘peacebuilding’: Peacebuilding missions either begin to co-exist with, or subsume, Chapter 7 peace operations which are mandated to ‘use force’ or ‘all necessary means’ for protection of UN personnel, aspects of the civilian populations and often the mandate. This issue poses questions for the future of peacebuilding, and what the UN’s Peacebuilding Support Office, and the Peacebuilding Fund (PBF), has envisioned as a renewed role for the concept. Lack of exit strategies: The final trend noted in the data findings is the lack of support which mandates provide for ‘exit strategies’. Whereas the words ‘exit’ and ‘exit strategies’ are mentioned irregularly in some of the UN resolutions, these references refer to decisions taken by the organisation to withdraw. In this case, the concept of an ‘exit strategy’ therefore refers more to the UN’s organisational requirements and not those of the host country. Whilst work has been undertaken by the UN to support more effective local transitions through ‘benchmarking’, such benchmarking must be based on well-informed and non-partisan strategic objectives. That the AU and UN develop institutional support mechanisms which can retain the drawdown services of effective African-led mediation and facilitation panels and provide these panels with financial, logistical and technical support, as well as a budget supporting the mediation talks and meetings which they are required to convene. That the UN work together with the AU (particularly within the current UNSC-AUPSC and UN DPKO-AU PSOD partnerships) to learn lessons from AU-led technical assessment and fact-finding processes with a view to developing a more nonpartisan approach to the production of strategic objectives that should shape and inform mandates. Benchmarks should be considered at the beginning of a mission but should only be developed once clear and effective strategic objectives (and supporting objectives) shape the mission’s mandate. The UN should commission research which analyses the relationship between peacebuilding and Chapter 7 peace operations. The paper recommends that peace operations should not become ‘re-branded’ as ‘peacebuilding missions’ until: 1) UN PBSO further clarifies the types of activities which support peacebuilding and 2) until there is certainty that a further escalation of violence, or requirement for a parallel stabilisation mission, questions the existence of a peacebuilding mission.